For the past couple of weeks, everyone in the office has been waiting to hear that our coworker’s first grandbaby finally made his appearance. It’s so exciting to welcome a new baby! I just love the way they cuddle on you and smell so sweet after a bath! With that in mind, I filled this gallon paint can with a hooded bath towel, washcloths, and bath stuff (my favorite head-to-toe wash from Johnson & Johnson!). I know it seemed like we never had enough clean, soft towels when our babies were little. And the soap . . . sigh! Stuff I used: All patterned paper is from the Baby Bee Crate Paper Collection, and all ribbon but the organdy and gingham are from the same collection, Vellum metal-edged tag from SU! ; “Precious” zipper pull (on T) from All My Memories, lots of Sticky Strip and some foam tape. Altered items: Gallon sized paint can from Home Depot (I’m apparently on a paint can kick), Target Dollar Spot frame, and Making Memories letter. I kinda bumbled on the paint can (you can see how crooked the ribbon is, whoops!) since I ran out of Sticky Strip and used foam tape to adhere the ribbon to the can. I like the dimension, but dang, you can’t easy move that stuff once it’s down! The frame was totally inspired by the Queen of Shabby Chic, Lisa Zappa. I watched her make a frame (which she gave to me after!!!) in Milwaukee last year, and tried to channel her greatness when I was adhering all kinds of paper and rickrack and then sponging edges! Adrianna and I skipped out while the men worked on the second poker table and went shopping at our new favorite local scrapbooking store on Sunday. We ran into Carri Steele (Zippie) from splitcoast and got to chat a while. She’s hoping that her new catalogs are waiting for her in DC! Hope you got there safely, Carri, and hope you have a catalog in hand! We came home with tons of goodies I can’t wait to play with while I wait for my own copy of the catalog! This was taken earlier this evening. 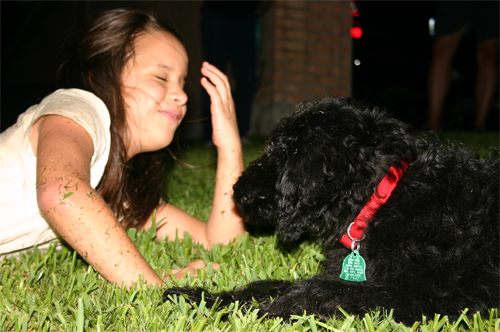 Adri used to be PETRIFIED of dogs. Our wonderful neighbors (and I’m not just saying that ’cause Debi reads this and loves to stamp and brings over yummy food and movies and loves the kids and lets us swim in her pool!) have had a few dogs, starting with Shadow when we both moved into the neighborhood around the same time. Adri was born right before we moved in (like, we closed just after she was born! ), and they’ve seen her grow up, and grow to LOVE their dogs. Jet is a such a happy puppy, and he and Adri were rolling ALL OVER the grass this evening. I think everyone could hear her screaming in delight, and shreiking at Jet’s puppy kisses. Totally happy that she’s over her fear of dogs! Not so happy about the amount of grass I have to clean out of the tub, but seeing this was SO worth it! 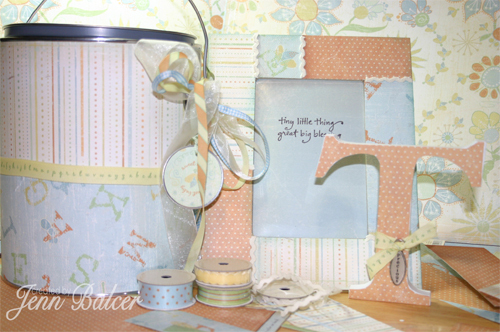 Love the baby set and this pic is so cute….will make a sweet scrapbook page! So glad she’s over that fear of dogs, too! Great picture. I really like the baby set. Those paint cans are so cute & everyone loves them. What an awesome baby set!! Love the papers & ribbon! I love that happy photo as well. Too cute! Wow Jenn…. what a SWEET gift!! Adorable baby set and what a great pic of Adri and the pup!! Jenn you are just amazing! All of it is FABULOUS!! Freaking gorgeous gifts, crooked ribbon or not!